Problem: If you have toddlers, they are probably tall enough to reach all the drawers in the kitchen (not to mention the oven), and they'll spend endless entertained hours emptying those drawers. But sometimes the contents of those drawers are dangerous. Solution: The obvious solution here is to install a baby safeguard lock, essentially childproofing your drawers and cabinets. But, read on. 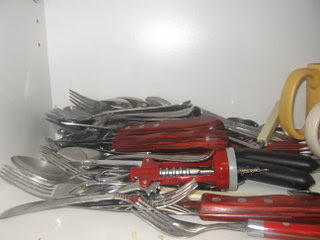 Problem: In my house, my toddlers have super-strength and easily bent the child safety locks out of position, leaving us with an open drawer full of sharp silverware, complete with a now-broken white plastic hook installed on the front. Solution: Get used to putting all sharp and dangerous items far out of baby's reach. You never know when one of those locks will break, and if you have to lock up the contents of a cabinet, I've learned, you really shouldn't have those objects in the lower cabinets anyway. Things may look a little messier in your house for a while. This is our new silverware drawer: the top cabinet over the counter intermingled with the coffee mugs. Good advice! We learned that in our baby safety class, too. For example, under our sink? pots and pans. All our cleaning supplies are in the hall closet way up high, and our dish soap and dishwasher soap are up in the cabinets. I don't have that many high cabinets, so all of our cleaners are in the only lower cabinet in the apartment with a proper baby proofer on it. All of the other ones were either ripped off, or taken while my back was turned, brought into some bedroom closet, and methodically dismantled with the ease of a rocket scientist!